Pink Is Releasing A New Single Called "What About Us"
Pink hinted at a comeback last week when she told a fan she was filming a new video and now it’s official. The pop/rocker announced that she’s releasing a new single called “What About Us” on August 10 via an Instagram post. That’s all we know about the track thus far, but if past experience is anything to go by the chance of Max Martin being involved is fairly high. Or she could become the latest female pop star to hitch their wagon to Jack Antonoff. After all, the veteran hitmaker was spotted at one of his shows in April. Almost five years have passed since the superstar released The Truth About Love, but she hasn’t exactly maintained a low profile. In 2014, Pink teamed up with Dallas Green to release an acoustic album under the moniker You+Me and netted a top 10 hit last year with “Just Like Fire” from the Alice Through The Looking Glass soundtrack. Since then, the 37-year-old has teamed up with Stargate and Sia on “Waterfall” and duetted with Kenny Chesney on pop-country fusion track “Setting The World On Fire.” See her post below. 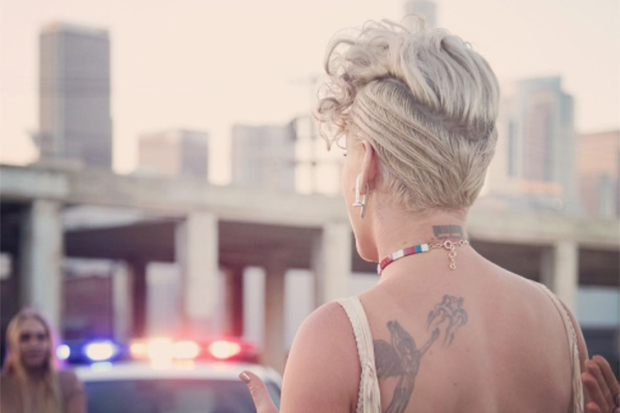 Are you excited for Pink’s new single? Let us know below, or by hitting us up on Facebook and Twitter!